Change from baseline in Scale for the Assessment of Negative Symptoms (SANS) scores during an 8-week trial in 23 patients receiving 50-mg/d D-cycloserine (horizontal lines) and 23 patients receiving placebo (circles). Dropouts are represented by a diamond at the final assessment. Vertical lines represent the range of values. Statistical analyses are presented in the text. Background In a preliminary dose-finding study, D-cycloserine, a partial agonist at the glycine modulatory site of the glutamatergicN-methyl-D-aspartate (NMDA) receptor, improved negative symptoms and cognitive function when added to conventional neuroleptics at a dose of 50 mg/d. Methods Forty-seven patients with schizophrenia meeting criteria for deficit syndrome were randomized to D-cycloserine, 50 mg/d (n=23) or placebo (n=24) added to their conventional neuroleptic for an 8-week, double-blind trial. Clinical assessments were performed at baseline and at weeks 1, 2, 4, 6, and 8. Serum concentrations of D-cycloserine, relevant amino acids, and homovanillic acid were assayed at baseline and at weeks 4 and 8. A cognitive battery was performed at baseline and at week 8. Results Thirty-nine patients completed the 8-week trial. Seven dropouts occurred in the D-cycloserine group and 1 in the placebo group. The mean reduction in negative symptoms with D-cycloserine (23%) was significantly greater than with placebo (7%) as calculated by slopes representing Scale for the Assessment of Negative Symptoms (SANS) total scores. Improvement of negative symptoms was predicted by low neuroleptic dose and low baseline SANS total score. No differences were found in performance on any cognitive test between groups or in changes in any other clinical measure. Clinical response did not correlate significantly with serum amino acid concentrations at baseline or with concentrations of D-cycloserine at weeks 4 and 8. Conclusion These results support the hypothesis that agents acting at the glycine modulatory site of the NMDA receptor improve primary negative symptoms. 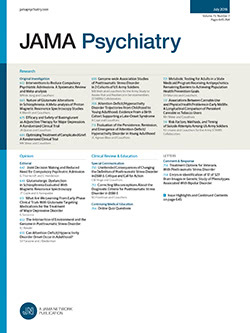 RECENT EFFORTS to direct pharmacological intervention at theN-methyl-D-aspartate (NMDA) subtype of glutamate receptor have followed from evidence linking this receptor complex to schizophrenia.1,2 For example, phencyclidine and ketamine, noncompetitive antagonists at the NMDA receptor complex, produce positive and negative symptoms, thought disorder, and cognitive symptoms that may better mimic schizophrenia than other pharmacological models.3,4 Because of the risk of neurotoxic effects, agents at the NMDA receptor do not represent a viable therapeutic approach to correct a hypothesized hypoactivity at the NMDA receptor complex.5,6 More promising are agents directed at the glycine modulatory site of the NMDA receptor complex that enhance activation of the NMDA-gated voltage-dependent cation channel with substantially lower risk of neurotoxic effects.7 Glycine acts as an obligatory co-agonist at this site, increasing the frequency of the NMDA-gated channel openings.8 In early open-label trials, glycine administered at doses ranging from 5 to 15 g/d produced improvement of negative symptoms in 33% to 50% of patients with schizophrenia, although results were inconsistent, possibly due to its poor penetration of the blood-brain barrier.9-11 More recently, Javitt et al12 reported that higher oral doses (0.4 g/kg per day or approximately 30 g/d) of glycine added to antipsychotic medication significantly improved negative symptoms (mean decrease of 15%). In a subsequent placebo-controlled crossover trial, glycine (60 g/d) was administered to 11 patients with schizophrenia for 6 weeks and produced a significant 36% mean reduction in negative symptom scores.13 Serum concentrations of glycine at baseline correlated inversely with the reduction in negative symptom scores (r=0.91, P<.001). We performed a placebo-controlled dose-finding trial with D-cycloserine added to conventional neuroleptics and found significant improvement of negative symptoms and performance on the Sternberg Item Recognition Paradigm (SIRP) at a dose of 50 mg/d without significant effects on psychosis, parkinsonism, or depression.18 When the dose-finding trial was repeated in patients treated with clozapine, negative symptoms significantly worsened at a D-cycloserine dose of 50 mg/d.19 Serum glutamate concentrations at baseline and the change in glycine concentrations significantly correlated with response of negative symptoms in the 2 dose-finding trials.19 Van Berckel et al20 performed a single-blind dose-finding trial in 14 unmedicated patients with schizophrenia and found that D-cycloserine (100 mg/d) significantly improved negative symptoms in 7 completers without affecting psychotic or depressive symptoms. However, Rosse et al21 failed to find an effect on negative symptoms when D-cycloserine at doses of 10 mg/d and 30 mg/d was added to molindone in a placebo-controlled, parallel-group study involving 13 patients. We set out to determine whether D-cycloserine (50 mg/d) added to conventional neuroleptics in patients meeting criteria for the deficit syndrome would selectively improve negative and cognitive symptoms as compared with placebo. Subjects were outpatients or inpatients with aDSM-IV diagnosis of schizophrenia, meeting criteria for the deficit syndrome. Diagnostic assessments were performed using the Structured Clinical Interview for DSM-IV and the Schedule for the Deficit Syndrome.22 To be eligible, patients had to have been treated with a stable dose of a conventional neuroleptic for at least 4 months. Patients were excluded if they had abused alcohol or any illicit substances during the past 6 months or had ever abused phencyclidine. Patients were also excluded if they displayed parkinsonian symptoms as defined by a score of 8 or higher on the Simpson-Angus Scale for Extrapyramidal Symptoms (SAS)23 or depressive symptoms as defined by a score of 25 or higher on the 18-item Hamilton Depression Rating Scale (HAM-D). In addition, a total score of 30 or greater on the Scale for the Assessment of Negative Symptoms (SANS)24 was required for participation in the study. After providing written informed consent, all patients entered a 2-week, single-blind, placebo lead-in phase, during which they were instructed to take 1 capsule at 8 PM daily in addition to their conventional neuroleptic. After completion of the placebo lead-in, patients who continued to score 30 or higher on the SANS were randomized in a double-blind fashion to D-cycloserine (50 mg/d) or placebo, administered in identical-appearing capsules for the entire 8-week fixed-dose trial. No changes were made in any psychotropic medications during the course of the study. The clinical assessment battery was performed after completion of the placebo lead-in (baseline) and after weeks 1, 2, 4, 6, and 8 or at the time of early termination from the study. Assessment instruments included the SANS, SAS, Positive and Negative Syndrome Scale (PANSS),25 HAM-D, Abnormal Involuntary Movements Scale (AIMS),26 and Global Assessment Scale (GAS). After training, interrater reliability on all clinical scales was established between sites and a correlation coefficient greater than 0.8 was maintained for the SANS and PANSS total scores by repeated assessments at 3-month intervals during the course of the study. Phlebotomy was performed between 9 AM and 11 AM at baseline and at weeks 4 and 8, following a 12-hour fast. Serum was placed immediately in a freezer at −80°C. Serum samples were assayed for concentrations of D-cycloserine, glycine, serine, glutamate, aspartate, and homovanillic acid (HVA). D-Cycloserine and amino acids were measured by a method involving o-phthalaldehyde precolumn derivatization, reverse-phase carbon-18 high-performance liquid chromatography separation, and fluorescent detection.31,32 Homovanillic acid was analyzed by reverse-phase carbon-18 column high-performance liquid chromatography separation and fluorescent detection. Absolute concentrations of HVA were determined using computer analysis of peak height with internal and external standards. Baseline comparisons between groups were performed usingt tests for continuous variables and the Fisher exact test for categorical variables. The efficacy of D-cycloserine vs placebo was analyzed by a mixed-effects model with a fixed treatment × time effect and a random intercept and time effect for each patient. In this model the response to treatment is the average slope, or change per week in SANS total score, during the 8 weeks of the study. This model assumes that each patient's SANS score can be fit to a straight line, the slope and intercept are random, and the actual scores are randomly distributed about the line with independent errors. This model is commonly used for longitudinal data and maximizes information from dropouts.33 The estimation method down-weights data from patients with missing observations and is valid when the observations are missing at random.34 This procedure was repeated with total scores on each subscale of the SANS. As an alternative approach, the changes in SANS total scores from baseline to week 8 were compared between treatment groups by t tests using last observation carried forward. To see if the response to treatment remained significant when controlling for covariates that vary by time (SAS, Positive Symptom subscale of the PANSS, HAM-D), a mixed-effects model was used. This model had fixed treatment × time and treatment × covariate effects and random intercept, time, and covariate effects for each patient. Patients were considered to be evaluable for efficacy analysis if they completed the clinical assessment at week 1. Statistical analyses were performed using SAS software (SAS Institute, Cary, NC). Results are given as mean±SD except for differences between slopes, which are expressed as mean±SE. All statistical tests are 2 tailed and an α level of .05 was used for tests of significance. To determine whether baseline covariates predict the magnitude of response (average slope) to D-cycloserine in the treatment group, a mixed-effects model was used. Covariates included age, duration of illness, neuroleptic dose, baseline scores on the SANS, SAS, HAM-D, and GAS, and baseline concentrations of amino acids. This model had fixed time and covariate × time effects and random intercept and time effects for each patient. To estimate the change in active minus placebo response (slope) per unit change in baseline covariate, a mixed model was used, which had fixed time, covariate, treatment × time, and treatment × time × covariate effects as well as random intercept and time effect for each patient. Changes in scores from baseline to week 8 on cognitive tests were compared between groups using t tests. The mean reaction time from all 4 trials was used for analysis of the SIRP and the differences in number of recalled words on list 1 (low context) and list 4 (high context) were used to analyze the effects of D-cycloserine on performance on the Miller-Selfridge Test. The slopes in serum analyte concentrations over time were compared between treatment groups using a random slopes model. In addition, Pearson product moment correlations were computed for the relationship between the slope of SANS total score, serum concentrations of D-cycloserine, and the change from baseline to week 8 in serum analytes. Fifty-one patients entered the study and 48 completed the 2-week placebo wash-in. One patient scored below 30 on the SANS at baseline, after completing the placebo lead-in, and was dropped from further study. Forty-seven patients were randomized (placebo, n=24; D-cycloserine, n=23). One patient in the placebo group dropped out during the first week after randomization, prior to the first assessment, leaving a total of 46 evaluable patients. The patient who dropped out during week 1 was included in the comparison of dropout rates between groups, but was not included in other analyses of outcome. The mean age of evaluable patients was 44.1±10.8 years, the mean duration of illness was 20.5±11.4 years, and the mean daily dose of neuroleptic (in chlorpromazine equivalents) was 912±715 mg/d. Seventeen patients were receiving depot neuroleptic and the remainder were receiving a variety of oral conventional neuroleptics. The D-cycloserine and placebo groups did not differ significantly at baseline in any clinical variable (Table 1). Eight subjects dropped out prior to week 8; 1 was receiving placebo and 7 were receiving D-cycloserine (P=.02, Fisher exact test). Three patients were dropped from study owing to worsening of psychotic symptoms; 1 patient (placebo group) was hospitalized during week 1, 1 patient required adjustment of medication during week 3, and 1 patient was hospitalized during week 7. Three patients left the study to travel with family or friends. Two of these dropouts occurred during week 3 and 1 during week 7. In addition, 1 patient dropped out during week 3 complaining of vague somatic discomfort and 1 patient dropped out during week 7 citing lack of efficacy. No other significant adverse effects were reported following randomization. The only significant difference found between dropouts and completers on clinical variables at baseline was a lower mean SAS score in dropouts (2.5±2.5 vs 1.1±1.0, df=28,t=2.67, P=.01). The rate of reduction on SANS total scores during the first 2 weeks was nonsignificantly greater in dropouts as compared with completers (4.31±1.42 vs 1.49±0.95, df=21, P=.11). The reductions from baseline in total scores on the SANS were significant for patients treated with D-cycloserine (df=44, t=5.82, P<.001) and with placebo (df=44, t=2.49, P=.02) (Figure 1 and Table 2). The difference in slopes between groups was also significant, indicating both a significant placebo effect and true treatment effect (Table 2). The 2 treatment groups did not differ significantly in slopes representing the change in the Negative Symptom and Positive Symptom subscales of the PANSS, HAM-D, GAS, SAS, or AIMS (Table 2). D-Cycloserine produced a mean 23% reduction in total SANS scores at week 8 compared with a mean 7% reduction in the placebo group. The rate of reduction in total SANS scores in the D-cycloserine group remained significantly greater than for the placebo group after controlling for change in the SAS (df=44, t= −2.45, P=.02), HAM-D (df=44, t= −2.27, P=.03), and Positive Symptom subscale of the PANSS (df=44, t= −2.50,P=.02). Analysis of slopes for the 5 subscales of the SANS revealed that only Blunted Affect subscale scores were significantly improved in the D-cycloserine group compared with the placebo group(Table 2). The reduction in SANS total score with D-cycloserine was inversely related to age, duration of illness, and the log of neuroleptic dose (Table 3). The difference in slopes between active treatment and placebo for SANS total score was inversely related to the log of neuroleptic dose and the baseline value of SANS total score (Table 3). Comparison of the change in SANS total scores from baseline to week 8 using last observation carried forward also revealed significant improvement with D-cycloserine compared with placebo (9.9±6.9 vs 4.1±9.3; df=44, t=2.39,P=.02). The D-cycloserine and placebo groups did not differ in baseline scores or change scores at week 8 on any cognitive test (Table 4). Serum concentrations of glycine, serine, glutamate, aspartate, and HVA did not differ between groups at baseline and only the slope of glutamate concentrations over time changed significantly with D-cycloserine (−5.25±14.9, df=33,t=−2.03, P=.05). Baseline serum concentrations did not correlate significantly with the slope of SANS total scores for any analyte in the D-cycloserine group. Neither did D-cycloserine concentrations at weeks 4 and 8 correlate with the slope of SANS total score. D-Cycloserine concentrations at week 8 correlated significantly with the change from baseline in serum glutamate (r=−0.72, P<.001) and HVA (r=0.76, P=.002). The significant improvement in SANS total scores with D-cycloserine (50 mg/d) compared with placebo replicates results from our dose-finding study18 and is consistent with recent trials of high-dose glycine.12,13 Because subjects met criteria for the deficit syndrome22 and response of SANS scores occurred in the absence of effects on parkinsonism, depression, or psychosis, this finding supports the hypothesis that enhanced activation of the glycine modulatory site can selectively improve primary negative symptoms. The clinical relevance of this finding is not easy to determine; a definition of clinically significant response of negative symptoms has not been established. The effect size of the difference in reductions of SANS total score between D-cycloserine and placebo, calculated by the difference in slopes divided by their SDs, was 0.80, which is considered a "large" effect size.35 Using a reduction in baseline SANS total score of 20% or greater as an estimate of a clinically significant response, 61% of patients achieved this level of response with D-cycloserine compared with 26% with placebo. It is puzzling, however, that improvement on the Negative Symptom subscale of the PANSS did not achieve statistical significance with D-cycloserine compared with placebo; the effect size of this difference was 0.47. For purposes of comparison, the effect size of the change in the Negative Symptom subscale of the PANSS with risperidone (6 mg/d) compared with haloperidol in the North American Trials was 0.26.36 Additional studies administering D-cycloserine for an extended time period and using scales sensitive to changes in quality of life will be necessary to determine whether D-cycloserine's effects on negative symptoms are primarily of theoretical vs clinical value. We did not observe any evidence of neurologic adverse effects, particularly worsening of extrapyramidal symptoms or tardive dyskinesia. This question follows from recent concerns about neurotoxic effects resulting from glycine agonists.9,38 In theory, combined use of glycine receptor agonists and neuroleptics could place patients at risk for neurologic adverse effects, because neuroleptics have been shown to increase glutamate concentrations in the striatum39 and elevated concentrations of excitatory amino acids in cerebrospinal fluid have been associated with tardive dyskinesia.40 Extended trials of D-cycloserine combined with neuroleptics will be required to fully evaluate the potential risk of neurologic toxic effects. As a partial agonist with approximately 40% to 60% activity compared with glycine, D-cycloserine's effect is determined by relative concentrations of endogenous ligands possessing varying degrees of agonist activity, including glycine, serine, and alanine, as well as the endogenous antagonist, kynurenic acid. We can conclude that D-cycloserine's therapeutic effects result from a relative agonist rather than antagonist effect at the glycine modulatory site because similar improvement of negative symptoms is also produced by the full agonist, glycine.12,13 Furthermore, the preliminary finding that D-cycloserine improved negative symptoms when administered to medication-free patients20 argues that D-cycloserine is not merely reversing effects of neuroleptics at the glycine site. Our failure to replicate earlier findings of a relationship between glycine serum concentrations and clinical response may reflect several factors. Whereas concentrations of glycine measured in cerebrospinal fluid are estimated to be high enough to saturate glycine sites on NMDA receptors, recent evidence suggests that glycine transporters in synaptic membranes may modulate concentrations of glycine within restricted diffusion spaces around NMDA receptors.48 Therefore, the relevance of serum glycine concentrations to concentrations at brain NMDA receptors is not clear. In addition, our sample consisted mostly of outpatients and, despite our attempts to enforce a 12-hour fast prior to phlebotomy, variability introduced by dietary intake of amino acids may have obscured any potential relationship between serum glycine concentrations and the central effects of D-cycloserine. It is also possible that inclusion of patients treated with several different antipsychotic agents over a broad range of doses may have further obscured such a relationship. Additional studies including measurement of cerebrospinal fluid concentrations of amino acids in pharmacologically homogeneous patient samples, with strict dietary controls, are needed to clarify this issue. We did not replicate our previous finding of improved performance on the SIRP with D-cycloserine and found no evidence of cognitive enhancement on any neuropsychological test. This is surprising, given the striking relationship between improvement of negative symptoms and cognitive performance in our dose-finding trial,18 as well as considerable evidence of cognitive enhancement with D-cycloserine over a narrow range of doses in animal models.18 It is possible that D-cycloserine administered at 50 mg/d did not produce optimal concentrations for cognitive enhancement, despite positive findings in our prior dose-finding study. It is also possible that the cognitive enhancement produced by a 2-week course of D-cycloserine, 50 mg/d, during our dose-finding study does not persist for the course of an 8-week trial. Enhancement of cognitive function in animal trials was achieved by acute administration of D-cycloserine; one study in which D-cycloserine was repeatedly administered demonstrated a loss of cognitive enhancement after 2 weeks of exposure.49 More studies employing individualized dosing and additional tests of cognitive function will be necessary to clarify this question. This study replicates our earlier finding that D-cycloserine (50 mg/d) improves negative symptoms when added to conventional neuroleptics, but failed to demonstrate effects on cognitive performance. Because patients met criteria for the deficit syndrome and negative symptoms improved in the absence of effects on depressive, parkinsonian, and psychotic symptoms, we conclude that D-cycloserine selectively improved primary negative symptoms of schizophrenia. Earlier findings of correlations between serum glycine concentrations and improvement of negative symptoms were not replicated. Accepted for publication August 11, 1998. This research was supported by grant R01-MH54245 from the National Institute of Mental Health, Rockville, Md, and the VA Schizophrenia Biological Research Center, Brockton, Mass. Reprints: Donald C. Goff, MD, Freedom Trail Clinic, Harvard Medical School, 25 Staniford St, Boston, MA 02114 (e-mail: goff@psych.mgh.harvard.edu).